Karras is probably best known as the dad from Webster, or maybe Mongo in Blazing Saddles, but to me, he’ll always be the closeted, then freed, bodyguard from Victor Victoria. God, how I love Victor Victoria. Animated GIF scrounged from Strange how you know inside me. And Nora Ephron didn’t even write the line. Billy Crystal supplied it as an aside (hence the Catskills). Which is REALLY obnoxious, because even in her obituaries, people quote THAT line, instead of, say, “I think I loved the IDEA of him,” which is one of the best lines about doomed relationships ever written. Or “Ride me, big Sheldon,” or ” You look like a normal person but actually you are the angel of death,” or the fight about the wagon wheel coffee table, or “Yes, and babyfishmouth is sweeping the nation,” which, for some reason, is edited out of some TV versions. So Nora Ephron’s intelligent, poignant script has been wailed out the window in favor of a one-off that’s barely amusing in repeated viewings. It’s no wonder she became a director. Which brings me to one of MY favorite Nora Ephron scenes. “Sleepless in Seattle” was one of those movies at which I wept, then I tsked as a drippy chick flick, and then last year, while I was pregnant with my second daughter and taking a weekend trip out of town–in the redwoods, and it poured rain the entire time, but we had TNT–I caught “Sleepless in Seattle” again. And I wept AGAIN, only not for the romance, but for the achingly sweet relationship between Jonah and his dad. The kid’s a wonderful actor, and Tom Hanks is Tom Hanks as I remembered him from the 1980s, when he was still the Best Boyfriend Ever. Watch the scene when Jonah wakes up from a nightmare and just TRY not to cry. The moment I always remembered from the movie is not between Jonah and Sam, though. In fact–I almost hesitate to say it–it’s about how chicks like chick flicks and dudes like dude movies. But it’s also about friends hanging out and talking about movies. Which I think is fitting for this blog. First Donna Summer and now Robin Gibb. And like Donna, I guess you wouldn’t think of Robin as a Slumber Party Movie icon…unless you remembered that The Bee Gees co-starred in the 70’s Beatlesploition flick, Sgt Pepper’s Lonley Heart’s Club Band. Because there wasn’t any dialogue in the movie. To quote The Kids in the Hall, don’t let that scare you, let that free you. None…unless you count the narration by George Burns. Come on. Mellow out. A man has died. Here watch these videos, and all will be clear…er. Also, please note the sweet bit of acting Robin does at the end, shaking his head as if to say, “Nah man. Just let him go.” But not actually saying it. No dialogue. Get Back Robin! Oh Billy Preston, we need your funky, zappy finger of power now more than ever. Today we lost a Slumber Party giant. 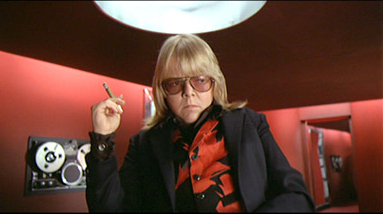 William Finley , the star of Brian De Palma’s gothicampy masterpiece, Phantom of the Paradise, died today. Tongue firmly planted in a raw, bloody cheek, Phantom of the Paradise stretched the audience’s ability to suspend disbelief. Stretched? Make that tortured. We were supposed to believe that Jessica Harper rocked the house, that Gerrit Graham was super studly and, the biggest stretch of them all, [SPOILER ALERT] that anyone would ever make a deal with The Devil so that they could look like this for the rest of eternity. Where did I put that thing?